« Waspish Wednesday: Now, with Real Wasps! I remember after I first moved to the country, in 1998, being awoken at dawn by an unearthly sound. No, they will keep you awake for hours. 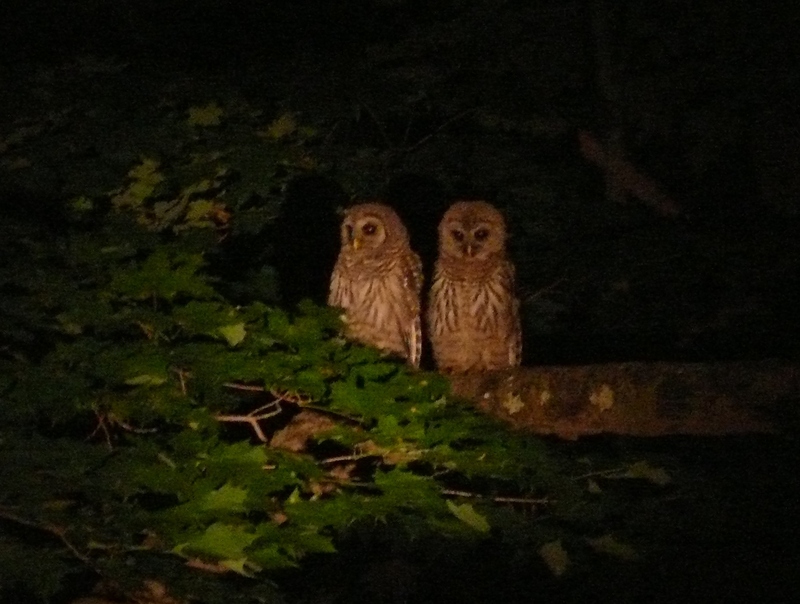 Eventually I discerned, amongst the sometimes chimpanzee-like shrieking, a hooting suggestive of an owl, and I looked up their call in my bird books and discovered it was a pair (or more) of barred owls. Over time, I became used to them. Even though they still sometimes woke me up, I was able to go back to sleep, despite the screeching and calling and hooting. People think the country is so peaceful. Yes, sometimes it is. And sometimes you are trying to help make a documentary in your driveway and a pileated woodpecker keeps hammering during what is supposed to be your deeply meaningful parting line. But that’s a story for another time. Rather, it’s two posts for the future: one on pileated woodpeckers, and one about participating in a video to educate the public about health care access for people with disabilities. So, I was familiar with their calls. In fact, about three years ago, we even had a barred owl living near our house. We saw her during the day, because barred owls are sometimes active during the day, as well as night. She’d be in a tree nearby, or sitting on the bird-feeder pole, just hanging out, presumably waiting for some rodents to come looking for the seed spilled on the ground. (Barred owls don’t eat other birds, according to my bird books. Yet, the song birds stayed away while she was around.) We called her “Hedwig.” We were very fond of her. Okay, so I’m used to that. Then, several weeks ago, I started to hear a strange, repetitive, loud, annoying animal call at night, all night. I could mimic it when I heard it, but by the next morning, I’d forgotten how it sounded, and couldn’t reproduce it. Finally, I posted to my town’s list-serv, describing it as sounding sort of like a slide-whistle, or someone sucking in an incredibly deep, long breath until they were about to gasp. I said it was repeated all night. Someone on the list suggested that it was the call of one or more baby barred owls. Someone else in town called me to play me a recording of a barred owl pup juvenile, and yes, ding! Ding! Ding! Ding! They win the prize! That’s what it was. One night, recently, it occurred to me to take my camera outside when I took Barnum out to pee to try to get a recording of the call. It is below. There’s no video — you just see black. I was only trying to capture the sound. Hedwig is an excellent name. The picture totally looks like a Hedwig. I couldn’t play the file, but I think that’s the iPad’s fault. I am going to look for a YouTube video that isn’t in Flash. One of my hidden talents is a decent barred owl imitation! Hidden no longer! Are you going to make a Youtube of yourself to share your talents with the world? Your adoring public awaits! Actually, I can do a pretty good imitation of the adults, too. I can do the juveniles while it’s fresh in my mind, but not long after. Such cute ‘little’ creatures. 🙂 This post made me laugh, as I clearly remember the first time I heard a fox ‘scream’. I was still in high school and saying a long goodnight to a boyfriend outside, when we heard it. My parents house had a lot of foxes around, but I’d never heard this sound. We thought it was a woman screaming and we went in to get my parents thinking we should maybe call the police. My parents determined it was not human, and we did nothing. They talked to a neighbor who filled them in on what it was. Hmm, I have wondered if a sound I’ve heard has been a fox. There is one that lives nearby. Now I will have to see if I can find what they sound like. Aha! Thank you. I have heard that. And it sometimes sounds similar to the juvenile barred owl! I think I have mixed them up on occasion!